Though NYC has been cold a few days this week the weather has been mostly lovely. Sometimes all you need is something light to break the breeze. The Cloud Silver Capelet seen above would make the perfect top layer on a warm fall day. I saw this capelet on display with the cold weather accessories in the Rockefeller Center Anthropologie store. I wasn’t surprised to find that it was done by Sleeping on Snow — one of my favorite Anthro brands. The stitching on the capelet is a bit loose so you’d have to layer up as the weather gets colder. I loved the way it fell. It is a little bit more compressed than the website photo would have you think and I like it better that way. I admit it’s a bit “Lord of the Rings” reminiscent but paired with the right outfit you could transform it into the non-fur standout accent. But my favorite thing is that you could wear the capelet for either day or evening. I have put together a few Polyvore sets for the Cloud Silver Capelet: option 1, option 2, option 3. 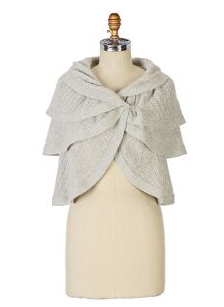 Have you seen this capelet in stores? Do you think it’s a must-have or a must-skip?